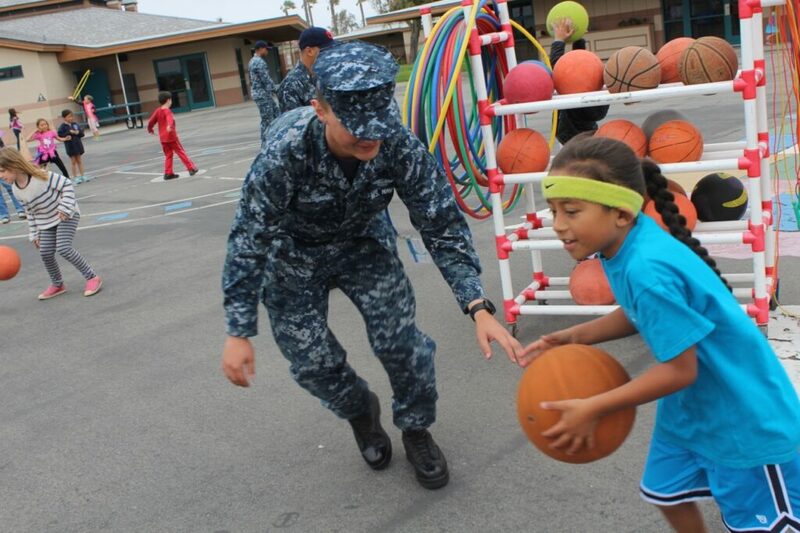 A Navy sailor plays basketball with a student at Silver Strand Elementary School as part of a school-military partnership. Schools across the country are preparing to formally track students from military families, monitoring their academic progress as they move from military base to military base and state to state, under a new provision in the federal education law. The change comes in response to concerns raised by the Department of Defense that the children of active-duty members of the Army, Navy, Coast Guard, Air Force and Marines have academic and emotional needs that schools often are ill-equipped to meet. At Chula Vista’s Veterans Elementary School, a new effort to support students from military families already is underway to help students like 5th-grader Victoria Ayekof. She had a rough start when she arrived last fall from a U.S. Navy base in Ghana where her father was stationed. Veterans Elementary is Victoria’s fifth school in five years and in the beginning, the adjustment was tough. Moving is what military children do — an average of six to nine times before high school graduation, according to the Department of Defense — but repeating the social and academic upheaval doesn’t necessarily make it easier to be the eternally new student. Having a parent away on military duty for months at a time is a major stress on the family. Research has found that military children who have a parent deployed are more frequently diagnosed with acute stress, depression and behavior problems than other children and that these mental health issues can affect a child’s ability to learn. California is home to the largest number of active duty military in the country, according to the Council of State Governments. Half of the state’s 60,000 military-connected students live in San Diego County, according to Kelly Frisch, regional school liaison officer for Navy Region Southwest. But even here, school districts don’t always know which students are from military families or how to address the academic gaps and anxiety they are more likely to have — particularly in “outlier districts where there isn’t a concentration of military-connected children,” said Kate Wren Gavlak, chair of the Military Interstate Children’s Compact Commission, a national organization run by the Council of State Governments. Under the Every Student Succeeds Act — the new federal education law passed in December that takes effect in the 2017-18 school year — school-age children in military families will be assigned an identification number known as a “military student identifier” that will allow schools to keep tabs on test scores, graduation rates and other metrics. Implementation details have yet to be announced by the U.S. Department of Education. The mental health risks for these students can be serious. A 2015 study co-authored by Ron Avi Astor, a professor at the University of Southern California, found that California students in military families were more likely to have attempted suicide than students from civilian families, based on the California Healthy Kids Survey given to 390,000 high school students in 2012 and 2013. Of students from military families, nearly 12 percent answered “yes” when asked if they had attempted suicide in the past 12 months, compared to 7 percent of students with civilian parents. To help schools develop support systems, Astor leads the Welcoming Practices consortium, a Department of Defense initiative of the University of Southern California and five districts: Chula Vista Elementary School, Bonsall Unified, Fallbrook Union High School, Oceanside Unified and Temecula Valley Unified. Among the recommended strategies are small changes, such as prominent displays of military family photographs, and more complex endeavors, such as creating a Welcome Center to smooth registration for newly arrived military-dependent students. At Veterans Elementary, a mobile app called WelConnect developed by the Welcoming Practices consortium, helps military families connect to programs and after-school activities run by their school district, the community and the U.S. military. While the districts in the consortium are ramping up, Silver Strand Elementary School in the Coronado Unified School District has spent more than a decade building a comprehensive support system. The school abuts streets of tidy red-roofed Navy housing and 80 percent of students are from military families, said Amiee Gillig, school liaison officer for Naval Base Coronado. “Most of them, through no fault of their own, come to us behind in academic performance and with gaps in their learning,” said Bill Cass, principal of Silver Strand Elementary. Funded by $6.5 million in federal grants over 10 years, the school has hired eight part-time specialists to work intensively with small groups of students on math, reading and writing in every grade. There also is a full-time military family life counselor, paid for by the Navy, who knows the students and their families and is available 8 a.m. to 8 p.m.
“We want students to feel, first and foremost, welcome and secure,” Cass said. As part of its program, Veterans Elementary recently hosted its first ever “Military Families Dinner” in a room festooned with red, white and blue balloons. Victoria and her mother attended. Joyce Ayekof said her daughter’s initial struggles have eased, and Victoria said she feels more comfortable, recalling the day her new classmates made a point of welcoming her in the cafeteria. Jane Meredith Adams covers social and emotional learning and student wellbeing. We welcome your comments. All comments are moderated for civility, relevance and other considerations. Click here for EdSource's Comments Policy. I see a benefit to this program if it is more than just a box to check. There are school liaison officers that are supposed to answer these questions and assist families in new locations. How about making the educational system have the same requirements in every state? As a high school parent, it is rather frustrating to move to different schools and learn what one state requires versus the next state. What one state calls a required government course, next state calls an elective. What one state requires a project for graduation, the next requires volunteer hours. We need to streamline the educational system which will ease up the stress on kids coming in. Expectations would be set freshman year and military kids/civilian kids would know what was expected of them for graduation. I wrote a book, Students Who Move And Transfer Schools, which is intended to assist parents, students, teachers, and all school officials about the difficulties children of all ages can face when a change in schools occurs. The book is available for purchase through any of the book purchasing sites. Feel free to contact me if you have any questions. First, this is not a new requirement. All 50 states were signatories to the Military Interstate Compact (‘MIC3’) which installed these same requirements. AB 343 (Saladana) added California’s signature to the Compact in October 2009. The problem was 2/3 of all schools and 2/3 of all states did not honor the Compact’s precepts – hence the need for legislative action. Second, our legislature had already attempted to rectify that problem. Sen. Block’s excellent bill, SB 369 (2015) would have required California schools to track and account for their military students. Sadly though even though the bill passed all stages unanimously (literally 209-0), it was inexplicably vetoed by the Governor last Fall. Thankfully similar language was inserted into ESSA shortly thereafter. Third, at least initially the “identifier” that schools must issue will simply be a check-box on application forms and in databases – something that identifies the student as being highly mobile and thus supported by certain rights. The most important of those rights are (1) the right to enroll in school immediately upon arrival in an area, even though that is usually in mid-term, (2) the right to enroll immediately even if certain paperwork (transcripts and health records etc) isn’t initially to hand, and (3) the right for “partial credits” to be awarded and accepted when previous coursework could not be completed due to the forced move. (These rights are essentially similar to the rights that already apply to other highly mobile students – migrant, homeless, foster, albeit sadly for foster students – only in California). The great news then is that with this development students from active-service military families (including National Guard, Reserves, those medically discharged and/or retired one year) will finally get the recognition and support from schools that there situation so thoroughly deserves. The only sadness is that despite the superb work of so many schools, and despite this requirement being in place since 2009, it’s taken a federal law to force all schools to comply. Thank you again for shining light on this important topic. This is a new requirement. The Military Interstate Compact, as you note, requires schools to accommodate the enrollment and placement issues that military-connected students experience. The Compact does not systematically track how well these students are doing in academics, chronic absence or discipline. The military student identifier is a reference number that will be assigned to each military-connected student and it will travel with the student from school to school. The number will allow the collective performance of military-connected students to be assessed by district, state and nationally, similar to the way student data is evaluated by family income level or race. This information has not existed nationally, nor was it the intent of the Compact to collect this information. I would imagine that the use of the military student identifier would bolster compliance with the Compact, because schools are being asked to pay more attention to these students. At this point, the identifier applies only to children of active-duty members of the Army, Navy, Coast Guard, Air Force and Marines. I appreciate your interest in the needs of these kids. Thanks for your response, and again your points are well made. Our concerns though are not with what the Act states but rather with how those words will play out in schools. In California the ‘identifier’ need only be a check-box on an application form (to the question : “Is the parent/guardian on active-service ?”). That will be reported to the state student database, CALPADS, via an additional ‘yes/no’ column in the Student Program Report. That response will be voluntary for next school year but ‘required’ for 2017-18. I hesitate when using the term ‘required’ simply because as yet there’s nothing to suggest what will occur if a school under-reports, or how CDE, or a district, or a county, would even know. In our conversations with schools following the passage of ESSA, itself following the veto of SB369, the clear message is that full implementation of the federal law will not occur, at least in its present format. Instead, for that majority of schools that have thus far failed their duties to identify military children, ESSA will simply mean that check-box response on application forms for CALPADS. They’ll still not appear in programs, nor in LCAPs, nor will there be (much, if any) oversight. To be clear, as you mentioned there are some wonderful programs in place already in the state, the problem being that they’re so few and far between. Sadly, it seems that for the majority of schools ESSA will simply be the rule by which they’re driven to comply with the Compact, albeit 7-8 years behind. Whilst that in itself is a huge step forward, it’s nowhere near where as a state and as a country we need to be. ESSA is a wonderful law, at least this part of it. The task for we advocates though, as with the Compact, is to get the majority of schools to give it more than just a cursory reading. Your column certainly helps, and again we’re very appreciative of that. 2019 EdSource. All Rights Reserved.